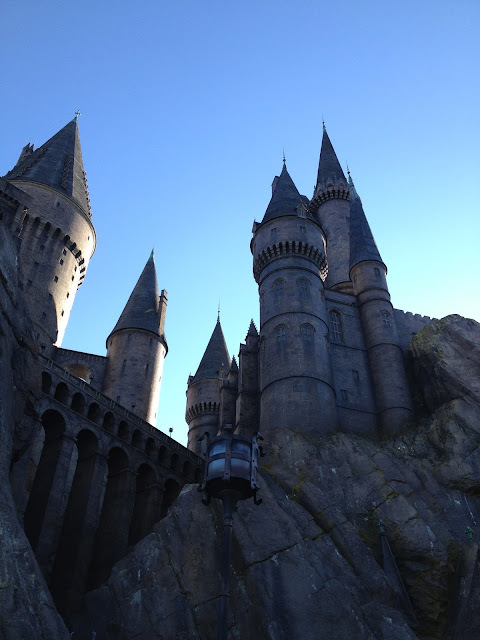 Joanna and her Amazing Technicolor Interwebs: Thanksgiving at Universal: A Trip Report - Day 5 - Hogwarts Hogwarts Hoggy Warty Hogwarts! 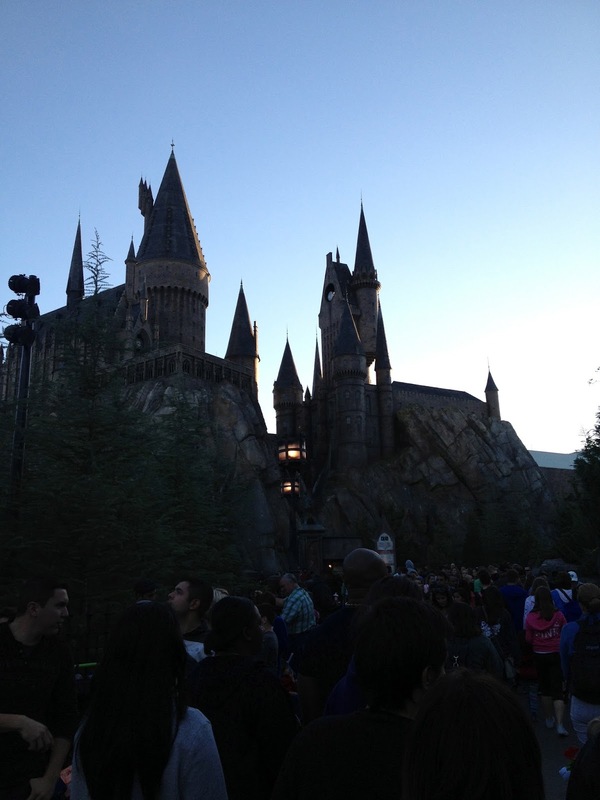 Thanksgiving at Universal: A Trip Report - Day 5 - Hogwarts Hogwarts Hoggy Warty Hogwarts! Not only did my family choose to stay at a non-Disney Resort this trip, we also chose to spend a day at Universal Orlando's Islands of Adventure! I know, I know, we're so far out of the Disney box, I can't even see the box anymore! Fact of the matter is, we're all Harry Potter geeks, and we've been wanting to visit the Wizarding World of Harry Potter ever since we heard it was on the idea board at Universal. If I'm being totally honest, I'll admit that I didn't care one bit about the rest of Islands of Adventure. I just wanted to spend the day suspending reality as I walked through Hogsmeade and Hogwarts as a wizard! There is so much to share about this day at Universal that today I'm only going to share Hogwarts and the Flight of the Hippogriff. Trust me, more is to come this week and next! We decided that Thanksgiving Day might be the best day to visit Universal. After so some careful research on parking, we headed out early in the morning and parked in Preferred Parking. (I'll explain more about parking at Universal vs Disney next week.) 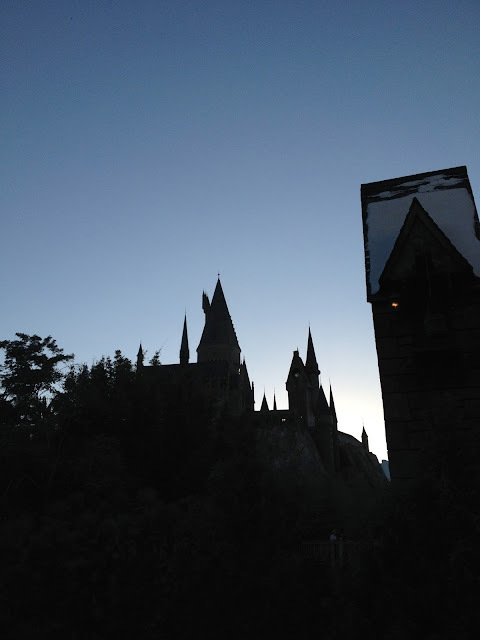 Once through the gate, we hurried straight for the back of the park to the Wizarding World of Harry Potter. Let me tell you, this was a LONG haul for the start to the day! We had to travel through Seuss Landing and the Lost Continent before we got a glimpse of the Hogwarts Express. While walking I did notice that the park seemed less crowded than I expected. This was thankfully the feeling most of the day. After a quick walk through Hogsmeade with the promise of returning later to explore, the entire family got in line to ride Harry Potter & the Forbidden Journey. This attraction's queue takes guests on a walk through the grounds, greenhouses, and castle of Hogwarts. Sprinkled through the castle are holograms of various characters from the movies. Many of the portraits move just like you'd expect. The Sorting Hat talks, and other magical moments happen throughout. It is absolutely immersive: I felt like I was in the books/movies. No detail was spared. 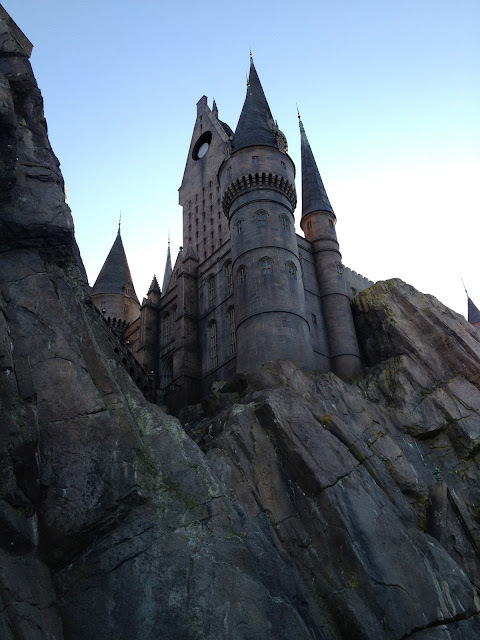 resist getting multiple beauty shots of Hogwarts. Enjoy! 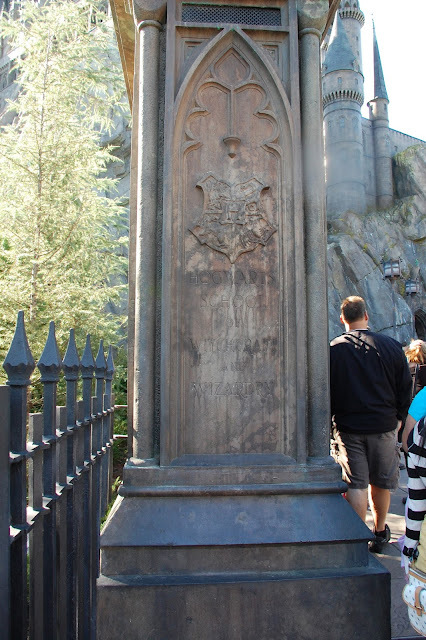 Forbidden Journey" would appear across it. These photos were all taken at various parts of the day. noon to evening in some of the photos. Even the silhouette is gorgeous! I took a photo with flash just so y'all can see the detail of these painting. Most moved and spoke as well! Dumbledore's Office - you can see him up there speaking to us. Don't you want to get your hands on his library? take the tour later, so you have time to hear their entire dialogue. she guarded the entrance to the Gryffindor Common Room. Unfortunately when we got to the end of the queue to board, the seats for this attraction were not Pooh-size friendly, so not everyone in our party could ride. I'll note here and expand on this later that weight is not the only factor that rules out this ride for guests. Those with broad shoulders or great height may not be able to ride either. I ended up riding alone. This ride was phenomenal: a great mix of simulations on screens and actual scenery and props. Characters from the movies join at you at various parts of your journey, and again, you feel completely IN the moment here. A fair warning: this attraction was intense and scary in parts. If you or your child are super creeped out by the huge spiders from Harry Potter & the Prisoner of Azkaban or the dementors from PoA and on, this might be too much. At times my heart was blood was really pumping! The way you sit in the seats, even sitting next to someone, you feel fairly alone on the ride, like it's really just you on a broomstick with whatever else is around you. The seats move rapidly and tilt all over the place at times, sometimes putting you face to face with a dementor or spider. Even knowing it's just a ride, being the chicken I am, I fought the urge to close my eyes during parts of it! Don't let this scare you away from riding as I was fine in the end and rode it again later. It's just definitely more thrilling than I expected! Once my journey was through, my family regrouped to check out a bit more of the area. Katelyn, LaRae, and I took a spin on the Flight of the Hippogriff. Josh and Randy, the less Harry Potter enthused members of our group, went to ride a few rides in Seuss Landing. The Flight of the Hippogriff is a small roller coaster similar in thrills to Disney's Barnstormer starring the Great Goofini. It's supposed to simulate a flight on the back of a hippogriff, so throughout the ride, you hear instructions from Hagrid. In fact, in the queue you get a good view of Hagrid's Hut and Buckbeak the Hippogriff. Overall I enjoyed this ride, but after the Forbidden Journey it was very mild. 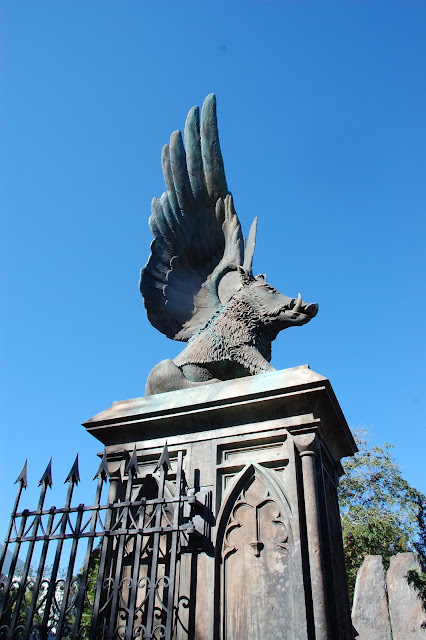 Buckbeak, the Hippogriff: be sure to bow and avoid eye contact! Did I mention that this morning's activities started crazy early? I don't think I ate much breakfast, and the kids were the only ones of us who carried much of a snack in their bags this day. Quick tip: if you're traveling with kids ages 3 and older, have them carry small backpack drawstring bags with their own snacks for the day. When they're hungry, they can grab a quick bite without needing to get your attention. It gives them a bit of responsibility and control over the day. Anyways, this being the first full day in a park, I misjudged how hungry I would get walking around the park. So in the queue for the ride, I was ready to eat a hippogriff myself! We ended up raiding Katelyn's bag where she had a bag of potato chips from the day before's lunch. You can guess what happened next... hunger mildly sated, then I was so thirsty that it was hilariously miserable. (Yes, we were all laughing about it!) So learn from my mistakes, and put a small water bottle and snack in your bag when you're going to spend an entire day in a park! Before lunch we looked around some in the shops in Hogsmeade. Katelyn and I went back later just the two of us to have some aunt/niece time and got a ton of photos to share, so that will be Friday's post. Wednesday though you can join us in Seuss Landing as we try green eggs and ham and check out the whimsical world of Dr. Seuss.